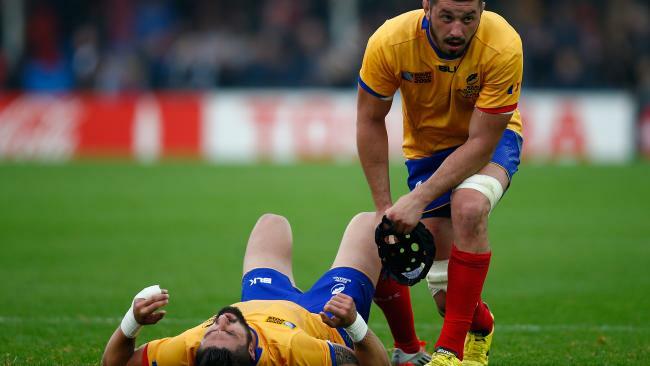 Dejected Romania rugby players Florin Vlaicu and Valentin Poparlan. ROMANIA has been disqualified from the 2019 Rugby World Cup after fielding ineligible players in qualifying. Russia has been named in its place. An investigation set up by World Rugby found Romania, Belgium and Spain fielded ineligible players in seven to nine games in the second tier Rugby Europe Championship, which also acted as a qualifying competition for next year's World Cup in Japan. As a result, all three teams were deducted points, leaving Russia to qualify for only its second World Cup. It goes in as the Europe 1 qualifier in Pool A, joining Ireland, Scotland, and Japan. Russia will play host nation Japan in the opening game of the tournament. Russia previously played at the 2011 World Cup in New Zealand. This will be the first World Cup Romania misses. Germany was promoted in place of Spain to a qualifying playoff against Portugal on June 9. The winner then faces Samoa for a place in the World Cup. The Russian rugby team stand for the national anthem before playing the USA. "While the independent disputes committee has determined that mistakes were not made in bad faith by Rugby Europe and some participating unions, World Rugby is extremely disappointed with the unfortunate and avoidable events," World Rugby said in a statement. World Rugby also handed out fines, suspended for five years, totalling $225,000 for Belgium, $180,000 for Romania, and $90,000 for Spain. Russian Rugby Union deputy chairman Kirill Yashenkov said it was "absolutely fair" his team qualified because other teams committed "grave violations of the rules." World Rugby ordered a review of the controversial qualifying match between Spain and Belgium in Brussels, whose result - an 18-10 win for Belgium - meant Romania qualified for the World Cup and not Spain by virtue of being the second-place team in the Rugby Europe Championship. 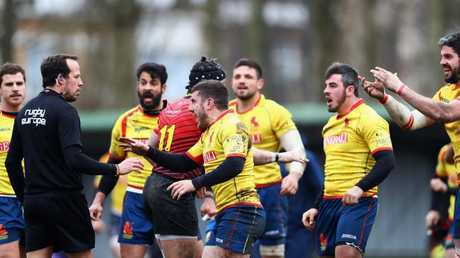 Spanish rugby players confront Romanian referee Vlad Iordachescu after defeat. World Rugby ordered a replay because it said although the Romanian match officials weren't biased, they gave the appearance of bias. However, the independent committee declined the request by World Rugby and Spain because the appearance of bias was not enough to overturn the result. The committee also criticised Rugby Europe for failing to change the match officials at Spain's request and, instead, asked the officials only if they wanted to step aside. The referee was chased out of the stadium by Spain players, five of whom were suspended for 14 to 43 weeks. "Rugby Europe deeply regrets this situation," the body said in a statement. It was seeking to improve the appointment of match officials, and work closer with national bodies on eligibility rules. World Rugby said it will oversee the appointments of all future match officials in Rugby World Cup qualifiers.